With all the sweet, tang, and bacon goodness that’s in it’s traditional counterpart, this German Cauliflower Salad is crunchy, delicious, and packed with flavor! 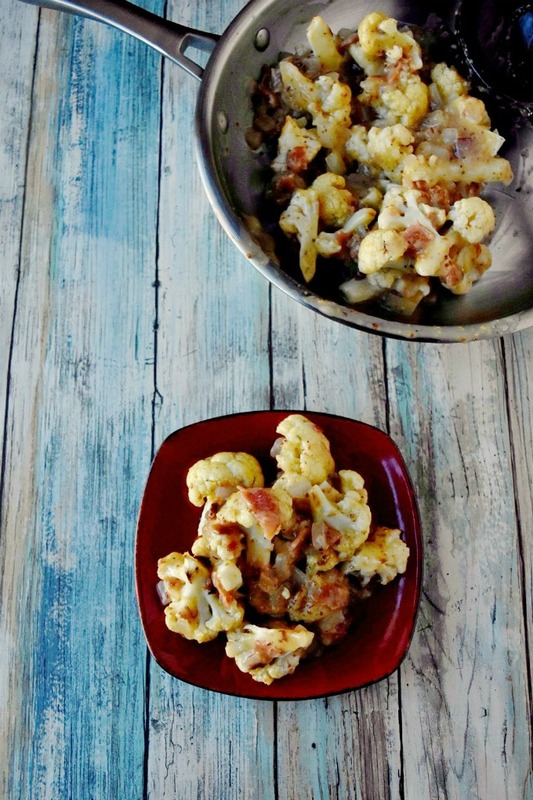 I think this is the first cauliflower recipe that I’ve shared. Corrections, I have two of them. It’s not the first recipe I’ve made, mind you, but I think it is the first one I’ve shared. This will not be the last one I share, either. Yes, that’s a threat. For years cauliflower has been in the shadow of broccoli. At least it has in our house. It’s not the start of the side dish world to us. It’s a supporting role to another vegetable we’re serving up that day. That’s going to change going in the future. Cauliflower is delicious on its own. Simply roast it with some olive oil, salt and pepper and chow down! It becomes nutty and amazingly delicious when you roast cauliflower. If you haven’t, you should roast your cauliflower. I have not riced cauliflower nor have I made them into tots, breadsticks, or pizza dough. These are all items on my list of things to try as a kitchen hoor. I’m a little weary of the breadsticks and pizza. It just looks… different. Let’s leave it at that. 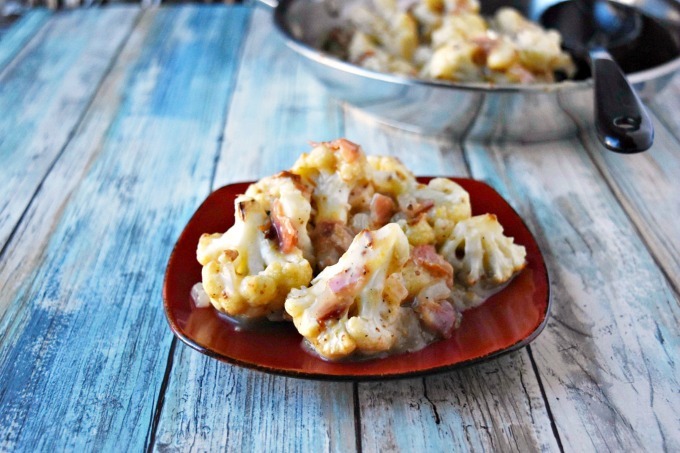 We have, however turned cauliflower into a delicious twice baked cauliflower casserole. You see, Dad and step-mom eats low carb. We had them over for dinner one night and we were determined to help them maintain that life style. You know me and a good challenge. I’m sure I discussed the kosher Thanksgiving at some point in my blog writing. Just recently, in fact. That was probably the biggest challenge I had. This cauliflower mash wasn’t so much of a challenge as it was an experiment. And it’s one that we will most assuredly make again. This is another one of those recipes we will be making again! You see, I love German potato salad. I mean, who doesn’t? It has that sweet and sour combination with the delicious bacon, onion, and mustard flavors. That dressing coats the potatoes perfectly! Consequently, when I saw the cauliflower event pop up, I knew that’s what I would make. German Cauliflower Salad! Since I’ve only had it out at restaurants and never made it at home, I thought I would try to make it at home. How difficult can it be, right? Well, let me just say, it’s not difficult at all! This all game together quickly, tasted amazing, and will be on the menu repeatedly. I wanted the cauliflower to have stand up flavor on their own, which is why I roasted them first. I wanted that nutty and slightly crunchy texture to my salad. Oh, and here’s a time saving tip. If you place your bacon in the oven while it’s heating up, you can save cooking time for the bacon! Wait, you don’t bake your bacon? Why not? It’s only THE BEST way to cook bacon. I baked my bacon while it was heating up, cooked the cauliflower, and while that was cooking made the dressing. That I wanted to eat with spoon out of the pan! HOLY MOLY that is amazing. It’s the perfect balance of sweet and sour. The slurry allows the dressing to be nice and thick. Thus, coating every piece of crunchy cauliflower goodness. The bacon adds that little sweet and smoky flavor. Then there’s the mustard and onions. I all honesty, I would put this dressing on cauliflower, potatoes, salad, a cracker, a spoon straight into my mouth. Oh wait, I told you that already. I’ve made bacon dressings before, but this one takes the cake. It is my new go to favorite from now on. Now cauliflower is my go to favorite vegetable from now on! Have you seen the creative recipes being shared today? OH! You should check them out. They’re amazing! Tots and bang bang florets, to breadsticks and soups. There is a recipe for everyone in this event this week. And thank you to Caroline from Caroline’s Cooking for hosting this event! I feel I guilted her into a bit. When I announced the event, I used her cauliflower recipe from the Sunday Supper Movement website. I just searched the site for cauliflower and it popped up all pretty and delicious looking. So, make sure you show her some love. Hosting isn’t easy. I should know!! Have you tried to use cauliflower in place of potatoes or rice? What’s your favorite cauliflower recipe for your family? With all the sweet, tang, and bacon goodness that's in it's traditional counterpart, this German Cauliflower Salad is crunchy, delicious, and packed with flavor! Line a baking sheet with aluminum foil coated with cooking spray. Place a roasting rack on top and place the baking on the roasting rack. Place the bacon in a cold oven. Turn the oven to 400. Cook the bacon for 15 to 20 minutes or until crispy. Remove from heat. Line a baking sheet with aluminum foil coated with cooking spray. Sprinkle with salt and pepper to taste. Bake at 400 for 10 to 15 minutes or until the cauliflower begin to brown slightly. While the cauliflower is cooking, place the bacon grease in a skillet. Sauté the onion until tender. Combine the vinegar with the remaining ingredients (sugar through black pepper). Add to the sautéed onions and simmer until thickened. 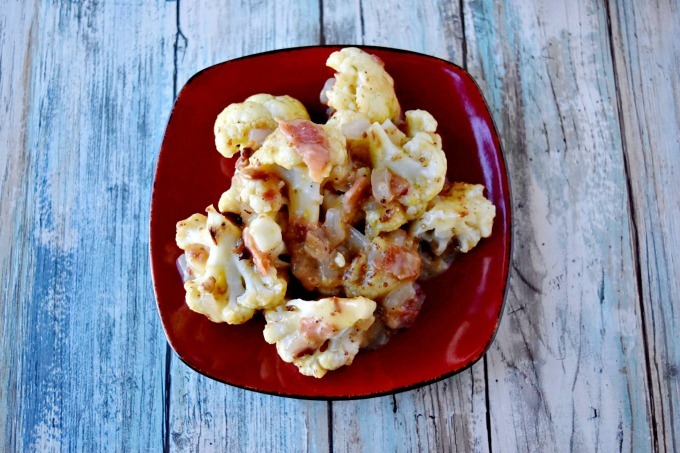 When the cauliflower is cooked, pour the bacon dressing on top and toss until coated. Serve warm. Oh my this sounds good! I have never had German potato salad but i always thought I’d love it because I’ve made potato salad in a hurry and eaten it warm. I never know what went into real German potato salad. 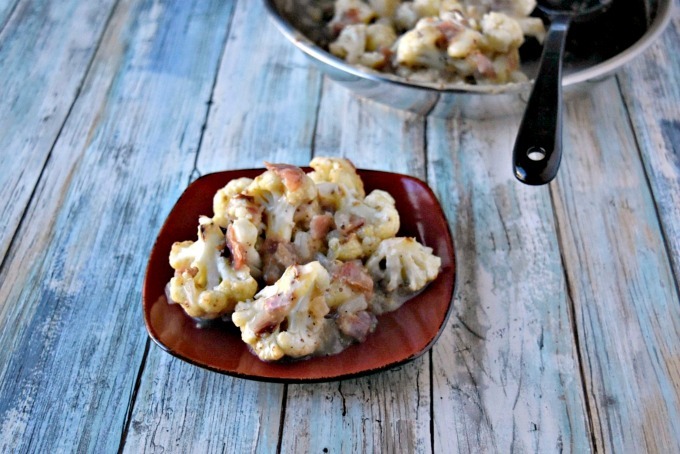 This sounds so good with the warm bacon, onions and mustard sauce and you used cauliflower! Can’t wait to try it. Thank you! I hope you like it. It really is delicious and so easy to make. I love this low carb version of German potato salad! I have a confession. I don’t think i have ever tried cauliflower, i am so embarrassed! I have no idea why because the recipes look delicious. I will pin and give this one a try though. I hope you do try it and like it. Cauliflower is just one of those vegetables that’s not in the fore front of your mind. It’s delicious, though! I always, always have cauliflower in the house and absolutely love it. I can’t wait to see what other recipes you make with it. Stay tuned! I have some ideas up my sleeve. We usually don’t have cauliflower so I have to do some research. It is rather hearty! Thank you! I LOVE this idea!!! I don’t do well with carbs anymore, so I can now enjoy a yummy “faux” potato salad! Brilliant!! 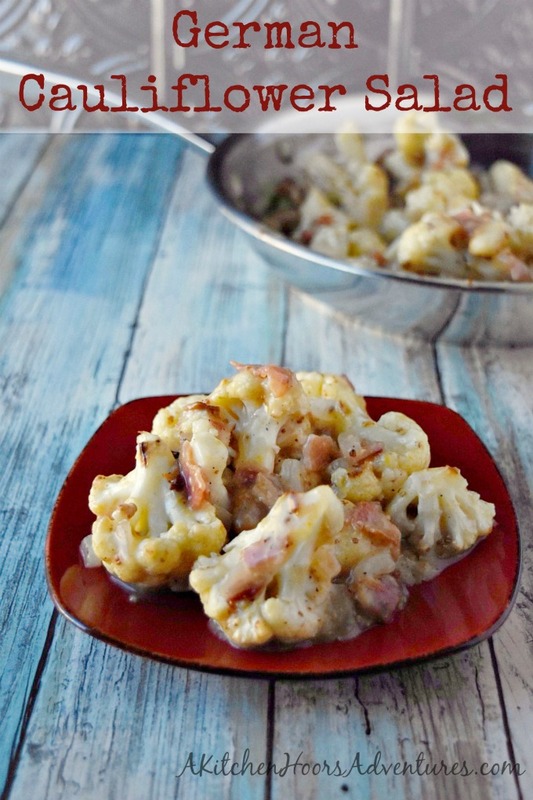 I don’t have many cauliflower recipes on my blog either, but this does look good!!! Bacon just makes everything better doesn’t it! I love this idea, Christie! What a great salad with wonderful flavors! It really does! That salty smoky deliciousness makes any dish irresistible.